 Late last year I wrote about how to calculate the optimal distance to stand away from a picture hung on a wall with the aim of making the picture appear as ‘large’ as possible (subtending the largest angle to the eye). This is a one-dimensional problem. The size of the picture is fixed (as is your height), and the only control you have is the distance you stand away from the artwork. There’s a very nice geometric proof for the solution. A natural extrapolation of this is into two dimensions, and the game of soccer (football to us Brits) provides and excellent vehicle to explore this with. A player with the ball can translate in two dimensions over the field to get into a scoring position. To score a goal, the soccer ball has to pass through two goal posts (and below a cross-bar), which are a fixed distance apart. 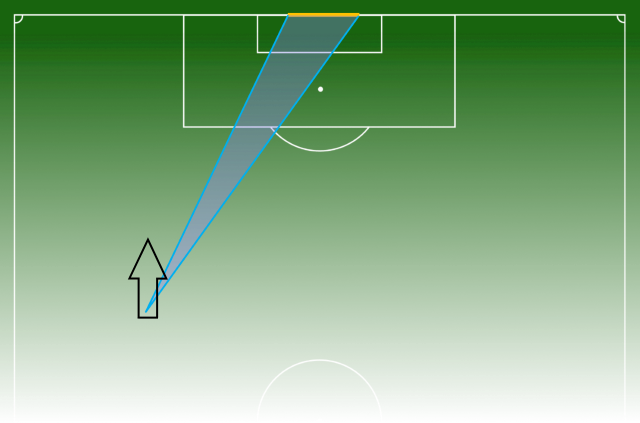 To a first approximation, the larger the ‘opening’ of the goal, the better the chance of scoring (minimizing the chances of errors in the precision of the shot moving it out of bounds). Also with a larger goal opening, there is more space to aim towards to defeat the goalie, (who also has more space to cover). We can see, therefore, that the larger the subtended angle to the goal, the better the chance of a score. If the striker is positioned down-field and between the goal posts then the nearer (s)he can get to the goal, the larger the angle becomes; this is the trivial case (and analogous to the picture on the wall being mounted so that the head is between the top and bottom edges). However, if the striker is running down the wings there is an optimal location to shoot from. As he runs down the field, the shooting angle gets progressively larger, up to some maximum value, then starts to decrease again as the player nears the goal line, and the angles get shallower. Below is a little interaction to experiment with this. Using the mouse you can position to player anywhere on the pitch. The shooting angle is shown in the blue triangle, and the angle (in degrees) is shown on the right. The “Show Max” button marks the locus of the optimal shooting position for a run down the field (If running vertically down the field towards the goal line, the shooting angle will increase up until the red line, then decrease after it is crossed). A player can always increase the shooting angle by running towards the center of the field, but if “South” of the redline, then the angle can also be increased by running towards the goal line. If the player is “North” of the redline, then it can be increase by running back towards his own half. The “Show Equal” button marks all the locations on the field that have the same shooting angle as the current player position. You can see this is a circle that passes through the two goalposts and the position of the player. (Again, for derivation of the this, see the article about optimal viewing distances). Here is a 3D animation of random positions of shooter. You can use the mouse to translate the view left and right, or in-and-out of the field. The player moves between random locations, and the shooting angle is rendered as a blue triangle to show how it changes. (Every other move, horizontal and vertical reticules are rendered on the screen). If you liked this article, you might appreciate this article about a Voronoi maps, and mapping of live player data. Here’s also an article about how the scoring might change in a game, and the probability that a team the ends up winning a game was winning the entire game. If you are interested in Tennis, this article is an analysis about how your skill at winning any single point can affect the probability of winning an entire match. There’s also this article that uses similar principles for how to estimate the height of a tree, without having to chop it down.